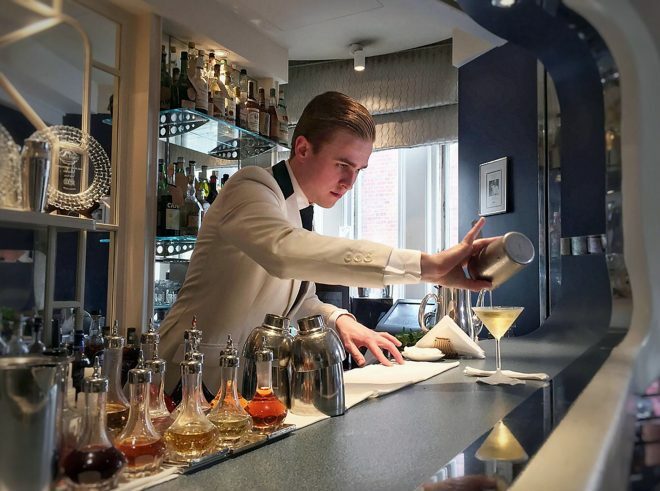 Joe is a barman at The American Bar in The Savoy Hotel, London. He makes two cocktails for us, one with Gin and Absinthe and the second with Rum and Mastiha. Well it was 1992 and my parents had a great evening… only joking, I’m Joe Lewis White and I was born and spent the majority of my life in Leeds, a city I hold close to my heart. I was never born into hospitality, it was actually something I stumbled into whilst working part-time in a hardware store. There was a local cocktail and wine bar called Manahatta by Arc Inspirations and everybody that worked there was super charismatic. I always wanted to work there and applied many times, until one day they called me for a trial and the rest is history. I was so passionate about the work and I convinced my parents this is wanted to do as my career. When I first came to London, I worked at Worship Street Whistling Shop with the likes of Matt, Tom and Ryan which was just phenomenal. It sounds romantic but I always set myself the target of working at The Savoy as it’s one of the most iconic bars in the world and I wanted to work here within five years. I love it here as our focus is wholly on the guest and the guest experience and never ever resting on our laurels. I love hotels, but I’ve always wanted to eventually open my own bar. Right now I think telling you exactly what I want is a little presumptuous. If I could have a dream bar it would be abroad, somewhere like Stockholm, Lisbon or Barcelona as I love those cities and think their bar scene is going from strength to strength. If I could own a bar I was proud of, that delivered quality drinks and made the local community happy I’d be satisfied. I want a bar with a clear concept, a sense of provenance and great hospitality. I think provenance is extremely important and I think everyone is starting to grasp that concept now. I’d definitely offer food and coffee too, so I’d be open throughout the day. I’d hate to disappoint people by being closed. Bars are kind of like football clubs and you can’t let down your fans. I enjoy quite simple things. I go to bars, I really like photography so I go to a lot of exhibitions and I love exploring London by walking everywhere. I think I would say whisky as I like the challenge of making lighter cocktails with it. There are also so many variations in flavours to work with from floral, smoky, peaty and salty. Maybe it’s because I’m Northern, but for me it’s tea. From traditional black tea to jasmin or herbal infusions it’s so diverse and adds a phenomenal aroma to a drink. Balance is key, which comes from knowing your ingredients, dilution, flavour and of course temperature. Go to Three Sheets and talk to the Venning brothers. They’ve created a great neighbourhood bar that’s open all day, they’re super hospitable and in my opinion offer a great example of a complete drinking experience.